Nonnis Food Originali Biscotti - 1.08 Oz. Nonnis Cioccolati Biscotti - 1.2 Oz. Nonnis Cracker Old London Keebler Jjflats Flavor Flatbread - 8 Oz. Nonnis Italian Quality Hearth Bread Crumbs - 5 Lb. Nonnis Quality Hearth Plain Bread Crumbs - 5 Lb. Thin Addictives Pistachio Almond - 4.4 Oz. 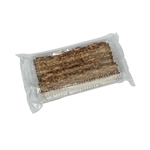 Cinnamon Raisin Almond Thins Addictives - 4.4 Oz. Thin Addictives Cranberry Almond - 4.4 Oz. Cranberry Almond Thinaddictives - 11.76 Oz. Dark Chocolate Almond Italian Cookie - 6.88 Oz.